As an editor working across the social sciences, but particularly in sociology, I have always found it useful to engage with the many popular blogs and community pages that are run by sociologists. More and more of these have sprung up in recent years, but there are several that have been around for a while and held my attention. Prominent among these are Sociological Imagination and Academic Diary. Dipping into both from time to time has helped blur the boundaries between professional interest – useful context and learning for my job – and personal interest. The draw for me has been that these address everyday issues in an informed and accessible way, but without the reader necessarily realising that they are being approached sociologically, and certainly without the reader needing a postgraduate qualification to understand. 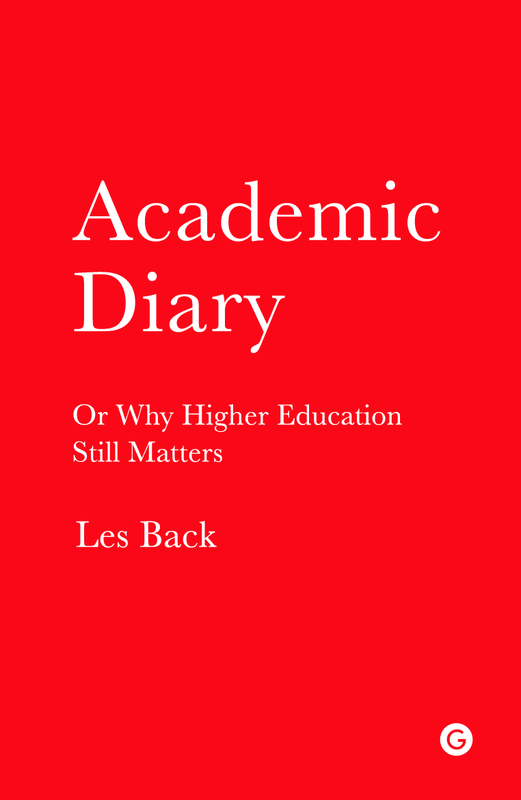 The Academic Diary blog was run by Les Back, a sociologist at Goldsmiths, University of London and the blog eventually formed the basis of the book of the same name, the first to be published by Goldsmith’s Press. 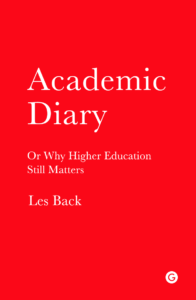 The book runs through the calendar from an academic’s perspective, using events in the routine of university life as places to both interrogate the institutions and processes involved, but also to offer sage advice on how to navigate life in the academy according to a simple philosophy. This philosophy is a basic whereby the guiding principles of thought and action are unselfishness and generosity, and this oozes from the book like the warm glow of an open fire on a wintry day. For me this is Back’s main contribution with this book. The reader cannot help but question their own actions and whether they need to be quite as self-interested as they increasingly and inevitably find themselves in today’s neoliberal higher education environment. Back therefore succeeds in offering a powerful critique of the direction of travel for university life, but in a subtle and often self-deprecating way. The feeling is always there, but the reader cannot imagine the author ever getting angry or losing their cool. The emotion is measured and thoughtful. The stories that pepper the months and schedules of the academic diary combine humour, wit and sadness, though are always hopeful. These everyday stories and histories are used to make general points in an incredibly personal way. Back also uses the book to highlight the scholars and authors who have inspired him, from students and colleagues, to scholars who have come before and influential authors. These come across in anecdotes and also in a more practical way through a section on further reading at the back of the book. The theme for University Press Week this year is that of ‘Community’. I chose Academic Diary because of the spirit of community that it engenders around higher education and university life. One of the many attractions of working at a UP is the place of our work ‘on campus’. We are publishers, and sometimes that comes first, but we are also sometimes allowed to feel part of the university family. This book brings that family to life. Whether we are publishers, porters, caterers, accountants, students or academics, we share this life and Back’s book offers a much needed reminder of the positivity of this. 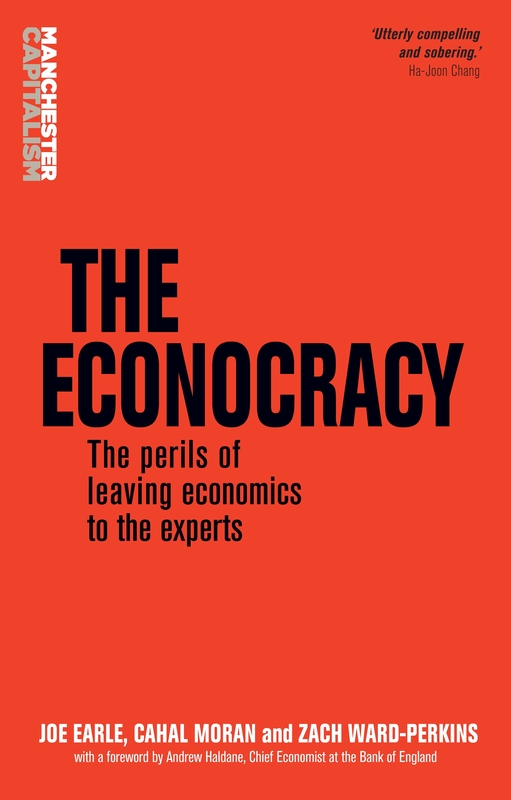 The MUP book I have chosen based on the theme of community is the recently published The Econocracy: The perils of leaving economics to the experts by Joe Earle, Cahal Moran and Zach Ward-Perkins. Here, the theme of community can be approached from a number of angles. Firstly, and to continue with the idea of the university community in Academic Diary, the Econocracy is unusual for a UP book as its authors are recent graduates, not academics. This puts them within the community of students, and it is from a specific community of students that they, and the book, have come. This community is economics students, and specifically economics students who are not satisfied with the way economics is taught at university. They come from the Post-Crash Economics Society at the University of Manchester, a society formed by undergraduate economics students in 2012, who found that when they arrived at university to study economics in order to understand the big picture, to understand how power functions, and to understand what happened in 2008, the economics curriculum fell well short. 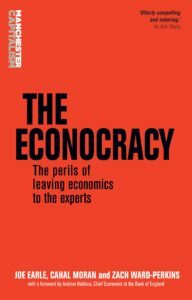 The book therefore comes from a critique of economics education: the lack of pluralism and reliance on neoclassical economics; the lack of analytical or critical thinking and the lack of real-world applications. This is an integral part of the book, and is admirably demonstrated through analysis of the modules on offer and the methods of assessment. However, this is just a small part of what the authors set out to achieve. This is a bold and powerful critique of a wider status quo. The book lays out the importance of economics and economists to the functioning and direction of the major democracies, institutions and processes at work in today’s globalised world. If we take that importance (rightly or wrongly) as a given, surely these economists are pretty well-trained and have received a broad education… right? Well, it depends on your opinion of what such an education should entail. So this book is about economics education, and a good case is made for the importance of this, particularly making use of novel research looking at university curricula and assessment. However, it does go well beyond this, asking an important and rarely asked question of the relationship between citizens and economics. Citizens on the whole, don’t get economics. Yet we are expected to trust our politicians and their economic advisors to steer things in the right direction for us. What if we did understand economics, at least a bit more? What if we could actually make informed decisions about the economy and actually make a difference in the way a democracy should allow us? That is the important message that the book goes on to ask. And the authors don’t just leave this question frustratingly out there, as so many critiques do. They provide solutions. The answers are just possible answers, but they are constructive attempts to revise how we as citizens interact with political decisions. This is important for economics, but looking at where we are today in this 2016 of madness, it is clearly vital for all other areas of social and political life too. Both of these books are unique and original, and both are arguably a far cry from what we might expect from a typical university press book. These are not heavy, dry, presentations of niche research that can only be read by a specific and small expert community. They are accessibly written, enjoyable books that anyone can and should read. They could not exist without the university-based experiences of the authors, so it is right for these particular Presses – the Presses of the specific universities where the experiences took place – to be putting them out. To me they represent a big part of the bright future of University Press publishing. Category: Blog, Economics, Politics, Publishing industry, Reference, Sociology	0 Comments.